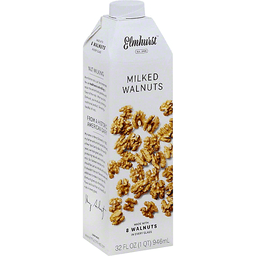 Elmhurst™ Milked Walnuts™. Est. 1925. Made with 8 walnuts in every glass. 32 fl oz (1 qt) 946 ml. From a historic American dairy. My name is Henry Schwartz. In 1925, my father and uncle founded Elmhurst, a New York family daily. For over 90 years, we took great pride in producing natural and nutritious milk. I believe nondairy milk should be just as natural and nutritious. It shouldn't be nut-flavored water with additives to make it look like milk. Elmhurst gives you the delicious flavor and nutrition of a handful of nuts in every glass. What is milked Milked (verb): To draw something from. The work "milked" best describes our unique process of using water to separate and draw out the nutrients from the nuts. These valuable nutrients, once released, re-combine naturally to make a very creamy and smooth beverage without the use of any added emulsifiers or thickeners. Our process allows us to use more nuts, which means a more delicious and nutritious nutmilk. Them (2 walnuts in every glass). Us (8 walnuts in every glass.) Non-GMO. No high fructose corn syrup. No artificial flavors. Carrageen free. Dairy free. Gluten free. Vegan. Please recycle. Learn more: www.elmhurst1925.com. 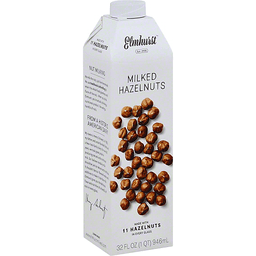 Elmhurst™ Milked Hazelnuts.™ Est. 1925. Made with 11 hazelnuts in every glass. 32 fl oz (1 qt) 946 ml. From a historic American dairy. My name is Henry Schwartz. In 1925, my father and uncle founded Elmhurst, a New York family dairy. For over 90 years, we took great pride in producing natural and nutritious milk. I believe nondairy milk should be just as natural and nutritious. It shouldn't be nut-flavored water with additives to make it look like milk. Elmhurst gives you the delicious flavor and nutrition of a handful of nuts in every glass. What is milked The word "milked" best describes our unique process of using water to separate and draw out the nutrient from the nuts. These valuable nutrients, once released, re-combine naturally to make a very creamy and smooth beverage without the use of any added emulsifiers or thickeners. Our process allows us to use more nuts, which means a more delicious and nutritious nutmilk. Them: Thickeners + Emulsifiers + 5 hazelnuts in every glass Us: 11 hazelnuts in every glass. Non GMO. No high fructose corn syrup. No artificial flavors. Carrageen free. Dairy free. Gluten free. Vegan. Please recycle. recyclecartons.com. Learn more www.elmhurst1925.com.